You’ve spent the last two to five years of your life preparing to become a nurse. The time has come to step into your first official nursing job. You are likely extremely excited to finally be working in your chosen career field, yet apprehensive about how to proceed or what you might experience. Arming yourself with the right information and tools can put you on the path to success. As a new nurse, you have a lot to remember. References and reminders can be very helpful. Whether it’s the current CDC vaccine schedule, the newest information on AIDS research or the recommended pediatric weight-based dosing for a drug, getting accurate and up-to-date information is essential to being an effective nurse, no matter what area you work in. It used to be that new grads and seasoned nurses alike had to use reference materials located at the nurses’ station or in the hospital library. Many times, nurses had to carry around pocket reference books — in pockets that were already full of pens, medical scissors, scratch paper, and alcohol swabs. 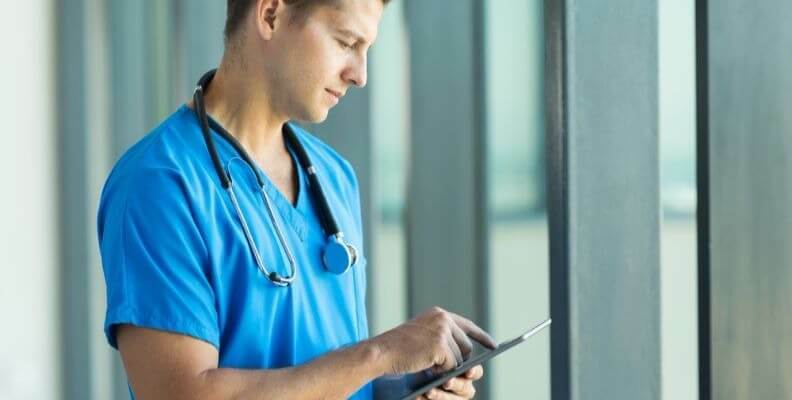 Nursing and technology have finally combined in an extremely useful way when it comes to your smartphone in the form of apps. There are dozens of nursing and drug apps that can be useful to nurses, and especially to new grads. This means all you have to have is your smartphone in your pocket. You don’t have to make extra trips back to the nurses’ station or carry a miniature library around all day. There are a plethora of medical, drug, and nursing apps available on iOS and Android systems. It can be difficult for some new grads to weed out the good from the bad when it comes to these apps. Unless you want to take the time to go through each app yourself or waste space on your phone by saving everyone, our new grad nursing app guide can help you choose which apps will be beneficial to have at your fingertips while on the clock. Available on both iOS and Android for only $2.99, the Micromedex Drug Reference Essentials is one of the most popular nursing apps around and allows you to access drug information without the need for an internet connection. With 4,500 search terms, drug interactions, dosage information, and side effects, this app might be the only drug reference app you need. The best part is that if your employer already pays for access to Micromedex, you can get free access to this app. The Nurse’s Pocket Guide for iOS and Android may come with a hefty price tag for apps at $39.99. However, you have the ability to access it in a preview mode that provides information on diagnoses and recommendations. If you choose to pay for this app, you have information about more than 400 medical conditions and corresponding diagnoses and care plans at your fingertips. This app also comes with a comprehensive index to make searching quicker and easier for your busiest days at work. PEPID is available as a free trial on both iOS and Andriod. This new and improved version lets you purchase a la carte suites within the app. It can assist you with pill identification, dosing calculations, as well as provide you with the most up-to-date information on integrated clinical content from top healthcare associations. PEPID is optimized for each device, making it intuitive and user-friendly. It can help you on your path to critical decision making and help you avoid having to jump from one app to another in order to find the vital information you need. The information is presented in a bulleted format so that you can quickly and easily view the information you need to improve your quality of care. The Medscape app is another best nursing apps category. This informational resource can help you keep up with current nursing trends and medical information, no matter what area of nursing you are working in. With the Medscape app, nursing and technology meet so that you can stay up-to-date on any industry changes. This app gives you access to a medical directory, continuing education, medical news, and a clinical reference library. It is free and available on both iOS and Android. This comprehensive medical dictionary app is a mobile version of one of the best medical dictionaries available today. Tabor’s Medical Dictionary app gives you easy access to pictures, full-color illustrations, in-depth appendices, videos, and even audio pronunciations. You even have the ability to save favorite entries. It also contains over 65,000 medical definitions. As one of the medical apps, it is $50 for a 1-year subscription and is available for iOS, Android, Blackberry, and is also mobile browser compatible. Among the many good apps for nurses is Med Mnemonics. This app features more than 1,600 acronyms, rhymes, and memory tricks to help you learn multiple medical conditions, symptoms, and other medical terminology. The memory aids provided in this app will help improve your short and long-term knowledge base to make you a more effective new grad. As one of the go-to medical apps, it features a wide range of topics such as anatomy, surgery, biochemistry, and pharmacology. You can search the database and filter your results by discipline or system. It even gives you the ability to save your favorite tips and tricks and to create your own. Med Mnemonics is only $1.99 on all platforms. Whether you are working with the elderly, young children, or even pregnant patients, you will want to have this app on your phone among your other nursing apps—especially if you are working in a clinic or community health center. With so much controversy surrounding vaccines today, being armed with solid information on the topic from the CDC can help you be a more effective and knowledgeable source for patients. Featuring color-coded coordinates, auto updates, and hyperlinked vaccine resources, you can provide the solid information patients are searching for when it comes to this sometimes touchy topic. The CDC Vaccine Schedules app is free and can be found on both iOS and Android platforms. Available on iOS only, this app may not be the first app that comes to mind when you think about good apps for nurses or drug apps. However, it can literally be a lifesaver if you have it on your phone. It’s a popular app due to its adaptability in many situations nurses may face. MediBabble Translator can be downloaded with Spanish already included. You can also download several other languages such as French, Mandarin, Cantonese, Russian, German and Haitian Creole for free. This app can come in handy during the admissions process, for assessments, and for patient teaching. While more and more facilities are trying to provide interpreters, sometimes this is not always possible. This app can help you do your job to the best of your ability, no matter what language your patient speaks. While clinical and drug information is essential to your new career as a nurse, so is self-care and support. AllNurses.com offers an app for nurses for social networking purposes. With 790,000 members, you can find plenty of friendship and support here from new grads who have or who are walking in your shoes. Whether you need to ask a clinical related question or simply vent about a difficult patient, this is a great platform to help you on your career path. With AllNurses you can also find the latest in nursing trends, news, and updates, post and read messages, read and vote on polls, and search for specific topics. This app is free and available on iOS and Android. NurseGrid makes scheduling and communication easier and decreases some of the innate stress that comes along with these aspects of working as a new grad. If you are a new grad you may still be getting used to scheduling procedures and policies that are in place at work. The NurseGrid app was developed for nurses by nurses in order to help manage and streamline the scheduling process. On this app, you can look at your schedule, see who you are working with, send messages to your co-workers, and perform other actions to make your scheduling easier. For optimal performance, all employees in your unit or floor should be connected with this app. A new manager version is expected to be released soon. This app is free and can be found on iOS and the web.